Paulette Cohn from PARADE magazine has yet again managed to bring us another wonderful interview with Daniela Ruah, this time about the most awaited event of the season: the #Densi wedding. We also get a new batch of promotional stills, in anticipation of the episode. 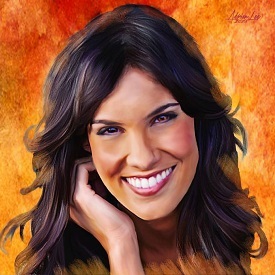 It’s been nine years in the making, but finally Special Agent Kensi Blye (Daniela Ruah) and L.A.P.D. Liaison Marty Deeks (Eric Christian Olsen) are going to walk down the aisle on this coming Sunday’s “Till Death Do Us Part” episode of NCIS: Los Angeles. And develop a relationship they did, despite Kensi’s history with men — they either die or leave her — and the resulting baggage she brought into the relationship. 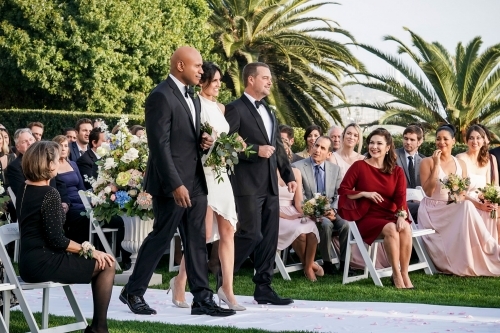 Of course, in typical NCIS: LA fashion, the wedding doesn’t go off without a hitch. Anatoli Kirkin (Ravil Isyanov) pays Deeks a surprise visit on his wedding day and he isn’t alone. So, even though it is a joyful occasion, it isn’t without the requisite action and crime solving. And Ruah takes a little bit of the credit for how the episode plays out. But in order for that to happen, the wedding dress had to have certain qualities. It couldn’t be strapless because that could lead to a serious wardrobe malfunction and it had to be affordable because there had to be multiples of the dress, especially because it goes from maxi to mini. For more scoop on the wedding — and the latest news on Linda Hunt — check out the rest of the conversation with Ruah HERE. Just as EW promised in August, Kensi (Daniela Ruah) and Deeks (Eric Christian Olsen) will finally marry on NCIS: LA. And we have a first look at the nuptials! In this exclusive video, Deeks declares how he’s finally marrying the woman he loves before the actors cut in with their own commentary about the highly-anticipated episode. “We’ve been able to develop this story in a very detailed way and now this is finally the culmination of that,” says Ruah. There’s also a “revelation” involving a box that Deeks get to open. “The whole episode is very sunshine and gun powder,” teases Ruah. The wedding bells will ring this Sunday at 9 p.m. ET on CBS. In the NCIS universe, it’s nearly impossible to get hitched without a few hitches. A prime example: the long-awaited wedding of Los Angeles special agents Kensi Blye (Daniela Ruah) and Marty Deeks (Eric Christian Olsen). 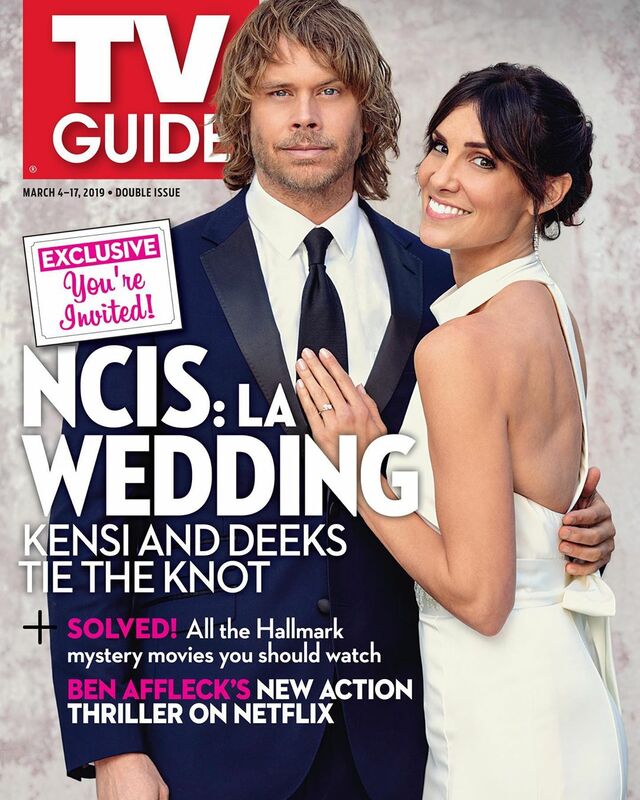 TV Guide Magazine was on set in January at the luxurious, Spanish-style Bel-Air Bay Club overlooking the Pacific for the surprisingly action-packed “Densi” nuptials. (It only took nine years for the two to get here!) We scoped out the stunning decor, saw surprises that made us drop our champagne flutes and gawked at one seriously damaged wedding dress. 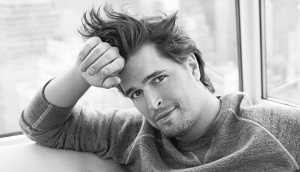 Executive producer R. Scott Gemmill, who wrote the special March 17 episode, was all for a roller-coaster ride to the altar. “In our world, there’s always some sort of mayhem lurking just around the corner,” he says. 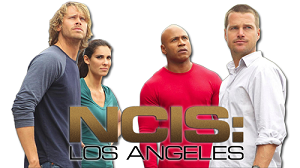 Densi has weathered kidnapping, torture, a helicopter crash and even a near-breakup. “Deeks once described Kensi as smelling like sunshine and gunpowder. [‘Two of my favorite things,’ the character explained.] It’s an apt description of the wedding,” Gemmill adds. It’s even the name of the event’s signature cocktail, which, by the way, consists of fresh orange juice, silver tequila and black pepper, shaken and served over ice with an orange slice. What ignites the gunpowder March 17 is a case involving an old foe, arms dealer Anatoli Kirkin (Ravil Isyanov), and some thugs whose criminal hijinks interfere with the big day. Densi’s NCIS team, who all RSVP’d “Hell, yeah” to the nuptials, do their best to keep the couple blissfully unaware of the crashers. But, as evidenced by Kensi’s distressed dress, you can’t keep good agents out of a fight. Thanks to Holly (babyitsbeautiful on Tumblr), we now have the scans of the full TV Guide article dedicated to the NCIS: Los Angeles duo. Check all the HQ scans at the gallery link below. Check all the HQ photos in the gallery links below and read the special article at TV Insider HERE.